Bring your family to Rhode Island's finest vacation destination, Pt. Judith in the coastal town of Narragansett. This 2 bedroom home has been completely remodeled in 2015. Enjoy cool ocean breezes on the enclosed front three season room or walk to the area's finest ocean front restaurants including the world famous Aunt Carries! This lovely home is located on a dead end street,directly off of Ocean Road, making it perfect for families and comes completely furnished with everything you need, just bring your bathing suit. A large deck with a new outdoor shower and gas grill makes outdoor fun a snap. 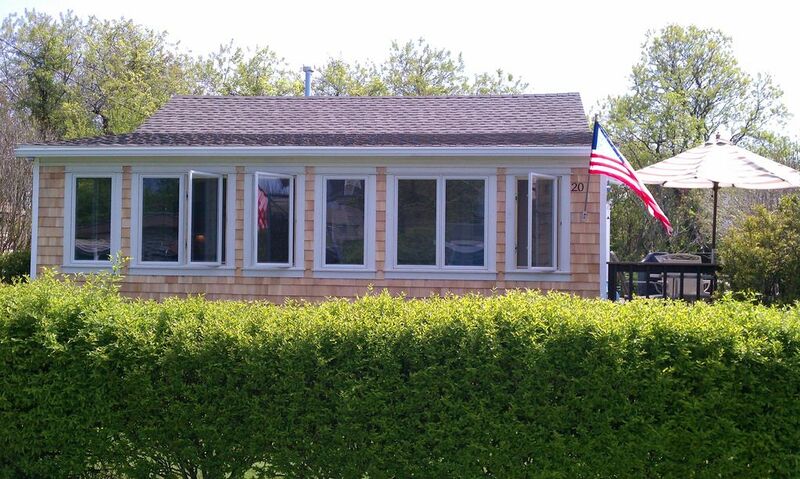 This home is located in a perfect location between Narragansett's finest beaches, less than a mile to the Block Island Ferry, and walking distance to just about everything. Plenty of parking and its perfect location makes this vacation home a bargain for your family's vacation! We supply bed linens,towels,and offer A/C(seasonal),high speed wireless internet, Hi Def TV,and are pet friendly! Please read all of our reviews. We include everything! Just bring your swimsuit! : If you choose this property for your vacation,just pack your family and your bathing suits. We include complimentary bed linens,towels facecloth's,paper towels,toilet paper,hand soap,dish soap,outdoor Weber gas grill and fuel,beach chairs,air conditioning,wireless internet,3 Hi Def TV'S, and so much more. Please consider these complimentary additions when comparing us to other rental homes in the area. We are a family of four who love the ocean and everything it has to offer. Its either a day at the beach,lobsters and clam cakes at Aunt Carries or a short walk down Ocean road to the tip of Rhode Island and the Point Judith light house. When we are not at the beach we are playing Soccer and Basketball and enjoying the Rhode Island coastline. We bought this property because it was located on a dead end street which was perfect for children. It has a very private back yard which you normally dont find at a beach home. There are two beaches in either direction from the home, and the Block Island Ferry is a two minute drive to get to. Ask my kids why this property, and they will tell you that they can walk to Aunt Carries and get clam cakes and chowder and home made ice cream. This property is unique because of its perfect location, but still offering privacy and a safe street for kids and families. There are two beaches, great ocean front restaurants, the Block Island Ferry, the Point Judith lighthouse, and many other numerous fun Summer things to do. We also allow pets with there families which many homeowners do not allow. Had a wonderful time the house was charming well-equipped and pretty updated. Looking forward to possibly renting it again next year. In proximity to a lot of things to do with friends and family. I have been renting beach houses in this area for the last 10 years. This was the first time renting this property with VRBO. The whole process was very simple and the property was as described. It had everything we needed. Was great that we were able to bring our dog with us on vacation for the first time and she loved it! Will be looking to rent this property again in the future. The house was clean and well maintained. Overall, I would recommend this property. We stayed with our 2 kids and small dog. The sun porch was my favorite room. The neighborhood is extremely quiet. Short distance to ice cream & food. We enjoyed the waves at scarborough beach, just a short drive down the road (within 2 miles). The house is well stocked with everything, just brought beach towels and food. The cabinets are stocked with utensils and plates. There isn’t any free cabinet for pantry/food items but there is counter space for them. Nice that they provide coffee, toilet paper, paper towels and laundry detergent. We enjoyed the outdoor shower too! Now my husband wants to install one at our home! A lovely quiet cheery little gem! wonderful Rhode Island beaches. We could have easily stayed many more days there. The owner, Mr. Whalen, was also extremely helpful, especially during the reservation process. We were bringing my two small dogs, so I had a number of questions about that. Mr. Whalen helped us locate a small beach area close by that let dogs have a “beach experience”, since most of the major beaches don’t permit dogs. He was also immensely patient about explaining the VRBO reservation process. We could not have asked for a more helpful property owner. quiet place to stay in the lovely Point Judith area. We assuredly would stay here again! We stayed the week of Memorial Day so the weather was a bit iffy, but otherwise it was great. The house was clean, all the essentials are there. The outdoor shower is a plus because then we can keep the sand out. Easy bike ride to Scarborough State Beach, Roger Wheeler Beach and Galilee. We do prefer to cook in, so the kitchen was a little small, but we managed. The bed was incredibly comfortable. Happy to be able to bring our dog, she also enjoyed the stay. Beautiful property, Great location house with every amenity better than expected we would return again ! The Pt Judith area is made up of beaches, fishing. Boating and all other coastal activities. Many of Rhode Island's best seafood restaurants are located in this area as well as access to the Block Island Ferry and all other Fishing and boating excursions. There are 2 casinos, Foxwoods/MGM Grand and Moheghan Sun located within 30 miles as well as Newport, RI which is a short trip by car. 50% of the weekly rental fee is due upon booking,with the balance due 15 days before rental period. You may choose to pay a refundable $350.00 damage deposit instead of purchasing the $59.00 non-refundable insurance. There is a $100.00 pet fee to bring any pet with you for your stay. Additional property damage protection will be required for all pets. Dollar amount to be determined by pet size and breed.